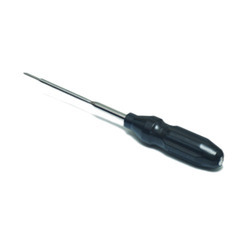 Manufacturer of a wide range of products which include orthopedic screwdriver. We are offering a wide array of Orthopedic Screwdriver all sizes.It has One pc and harden up to 48 HRC .The raw material is use for this is stainless steel 420 B.The handle is made up of high quality aluminium HE 30.Highly accurate with no worry of getting round. This screwdriver is demanded high all over the corners of country. To fulfil ever-evolving requirements of our valuable clients, across markets of the country.